I started the day, by getting some of my tools out in an attempt to tighten the chain. Of course, even though I did have tools for the job, the bolts wouldn’t budge. After several attempts, I ended up breaking my driver tool and I had to go to plan B. So I Googled the closest Ducati service dealer. I got lucky. 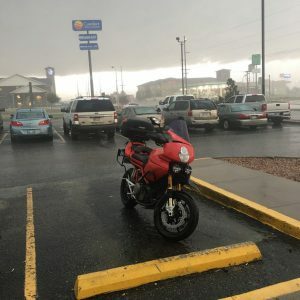 The only one in the entire state was only 20 minutes away, so our first stop for the day was Reno’s Powersports. 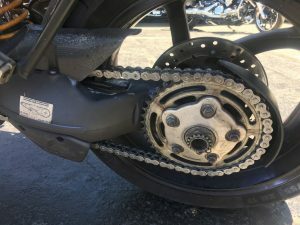 My chain was so bad, they ended up putting on a new one. We were in and out in only 30 minutes. Awesome! With a new chain, the bike felt like it’s brand new. I was ecstatic with how well it now rode and of course relieved that the gear box was fine. 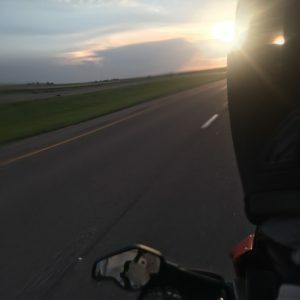 Our goal was to reach Hays, but there was rain in the forecast, and we were in a hurry to get there before it started. We didn’t want to get soaked like we did in St. Louis. As the ride went on, I spotted some clouds to the north and then some more to the south. Riding west we were lucky to dodge them, but our luck finally ran out. We stopped for coffee and decided that we couldn’t get past Hays without running into heavy rain. However, we might be able to get to Hays, before the rain arrived. We just made it. The raindrops were starting, as we pulled into Hays and we ended up heading to a diner for some dinner. The rain was coming down hard, and it looked quite stormy, but we were dry inside having steaks. About an hour later it had just about stopped, so we decided to get back on the road for another 100 miles. 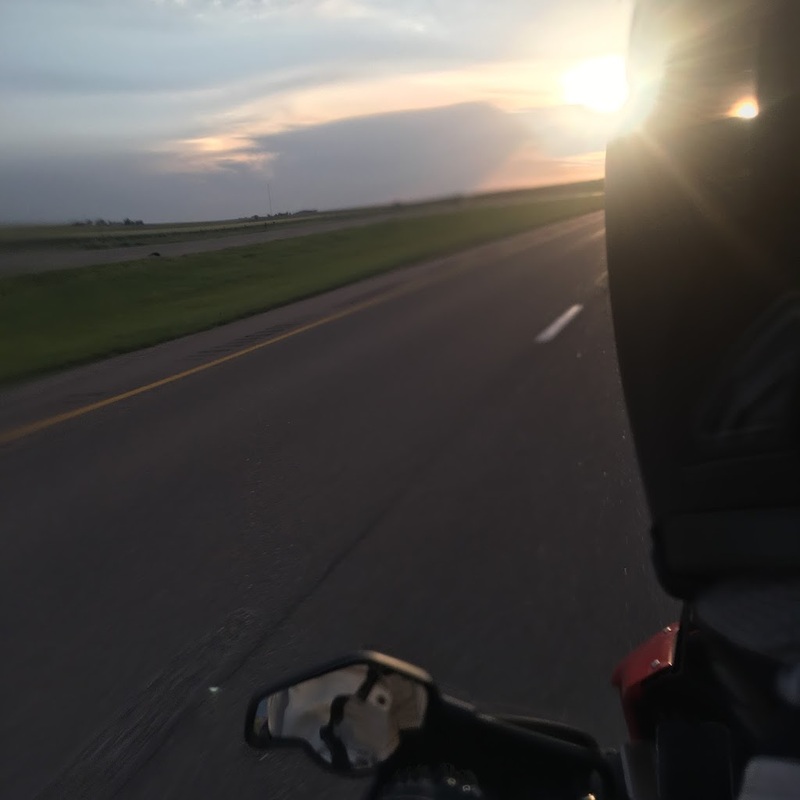 Just around 9pm and sunset, we pulled into Colby and finally got a hotel. Even with our late start, we put in 381 miles of riding, which puts us on track for being in Denver early afternoon tomorrow. Again trying to dodge some afternoon and evening rain forecasted in Denver.